Samsung's Galaxy Note 10.1 is an elusive beast. It first made an appearance all the way back in February at Mobile World Congress, and then the device showed up in a commercial, only to disappear almost immediately after surfacing. Where art thou, dearest Note 10.1? Has it perhaps been hanging out with Big Foot? Maybe it'll show up in physical form at IFA, but we're guessing it will be discussed during Samsung's August 15 Galaxy event in New York City. What we do know, thanks to Mr. Anonymous, are the possible specs. Great! 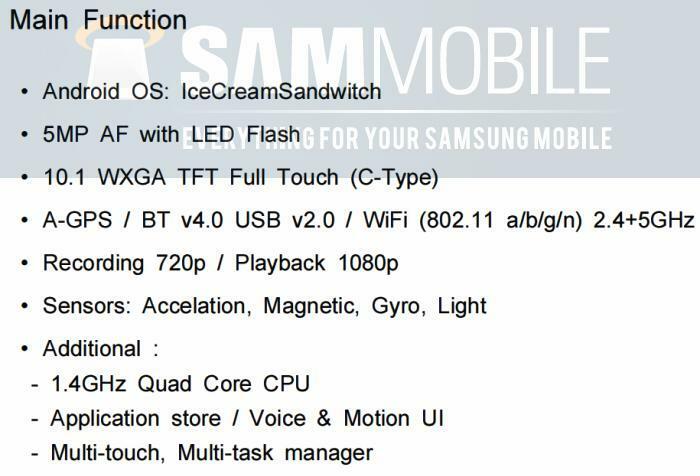 According to SamMobile, which acquired a service manual for the device, the Galaxy Note 10.1 will come equipped with the same 1.4 Quad-Core processor found in the Galaxy S III, along with Android 4.0 Ice Cream Sandwich — plans are in the pipeline to upgrade to Jelly Bean "later on," SamMobile said. The device has hovered in gadget purgatory for the past several months, and in that time Google has released the Nexus 7, which is probably the better option of the two. Still, The Note 10.1's S Pen functionality could be a real attraction for students and artists, particularly if the device hits before school starts back up. Check out the rest of the supposed specs in the screenshot above.